Every night before bed, Steve and Ian read Calvin and Hobbes. It's Steve's old edition from when he was a kid. By the end of 10 years, I'd said pretty much everything I had come there to say. I went to kindergarten with Watterson (hence Himself calls me Susie Derkins when he’s feel mean). Quiet, reclusive little boy, not at all like Calvin. What I hoped for in that interview was something about how he spends his time now, but no luck. I think it’s great that he stopped when he had nothing to say. But, I also value people who still have something to say: i.e. Doonsebury. I’m still loving it, and I love how it has changed with the times, seeing Alex grow up, for example, and the insight that gives us into other populations. C&H was more static — could Calvin grow up? But, I’d like to have seen Watterson try it. I am happy that C&H didn’t become Dennis the Menace with jokes recycled over and over again. I’m sure it helps stop that one is already pretty rich and will keep getting more money from T-shirts, books, etc. I don’t mean this to by cynical. I expect he means what he says and assume he’s sincere. But perhaps if he had made a lot less money on the strip and needed to keep producing it to pay the rent (I suspect that was so for many cartoonists, and is so for less successful ones) then he might well have found himself something more to say. Matt, No doubt Watterson makes the comfortable royalty income of a hyper-popular author, but there are no T-shirts. There’s never been a single licensed Calvin product, and actually, I wouldn’t imagine that the royalties on a limited number of volumes (compare the Calvin oeuvre to Garfield, or Doonesbury for that matter) makes the man filthy rich. 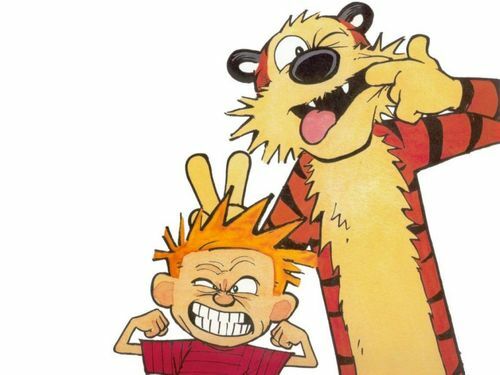 I’ve been assuming for a while that Watterson must have had some direct personal experience with adoption after he stopped creating Calvin — when given the chance to make revisions, he changed precisely two punchlines/jokes in the entire series, and both related to adoption — but it’s remarkable how little information we have on his private life. I did think Watterson was being … coy … when he said that the mid-1990s were ancient history in the pop-culture world. Calvin & Hobbes show up in almost every Scholastic Book Club flyer. For quite a few kids today, the comic is still very much part of the cultural landscape. I could be biased, though. We’re on our second set of paperback compilations, because the kids shred them through relentless re-reading.